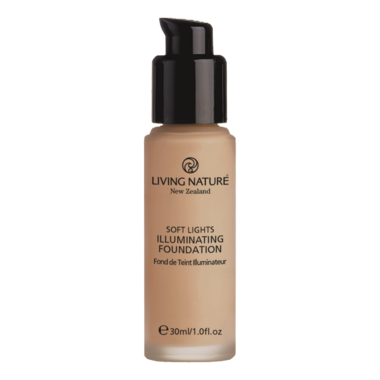 Living Nature's natural Illuminating Foundation in Dawn Glow is a light foundation tint with a gentle shimmer. It gives your complexion a soft radiance and minimizes the appearance of fine lines. Manuka Honey and natural oils give nourishment, and pure minerals provide the soft healthy glow. Great for evening wear. Ingredients: Aqua (water), Jojoba esters, Macadamia ternifolia seed oil (macadamia oil), Simmondsia chinensis (jojoba) seed oil**, Mica (Cl 77019), Titanium dioxide (CI 77891), Persea gratissima oil (avocado oil), Cetearyl wheatstraw glycosides (&) cetearyl alcohol (wheat straw extract), Glycerin (vegetable glycerin)**, Zinc oxide (CI 77947), Butyrospermum parkii butter (shea butter)**, Mel (manuka honey), Citrus grandis seed extract (grapefruit seed extract), Sclerotium gum, Stearic acid, Cetyl alcohol, Iron oxides (Cl 77491, Cl 77492, Cl 77499), Talc (CI 77718), Pelargonium graveolens oil (geranium oil)*, Leptospermum scoparium oil (manuka oil), Melaleuca alternifolia oil (tea tree oil), Tocopherol (vitamin E). *From natural essential oils: Citronellol, Geraniol, Linalool. **Certified organic.